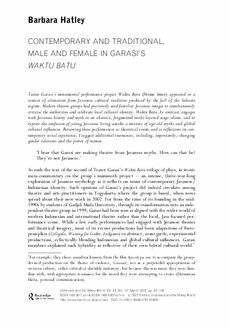 Teater Garasi’s monumental performance project Waktu Batu (Stone time) appeared in a context of alienation from Javanese cultural tradition produced by the fall of the Suharto regime. Modern theatre groups had previously used familiar Javanese images to simultaneously criticise the authorities and celebrate local cultural identity. Waktu Batu, by contrast, engages with Javanese history and myth in an abstract, fragmented multi-layered stage idiom, said to express the confusion of young Javanese living amidst a mixture of age-old myths and global cultural influences. Reviewing these performances as theatrical events and as reflections on contemporary social experience, I suggest additional resonances, including, importantly, changing gender relations and the power of women.